After two wonderful nights in Positano. 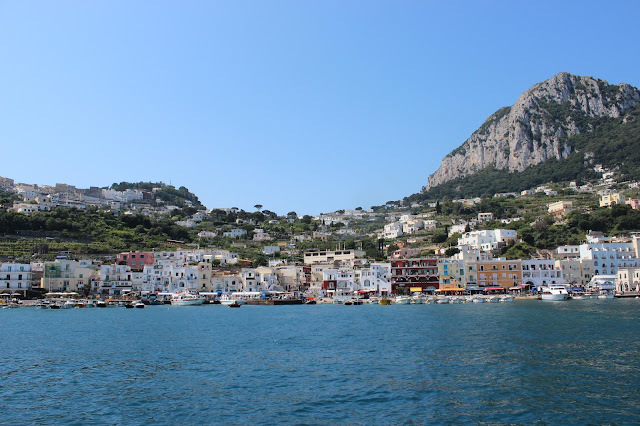 We hopped onto the ferry for an hour and a bit to the stunning island of Capri. We arrived in the harbour, and caught one of the local taxi's to our hotel. How cool is the taxi? 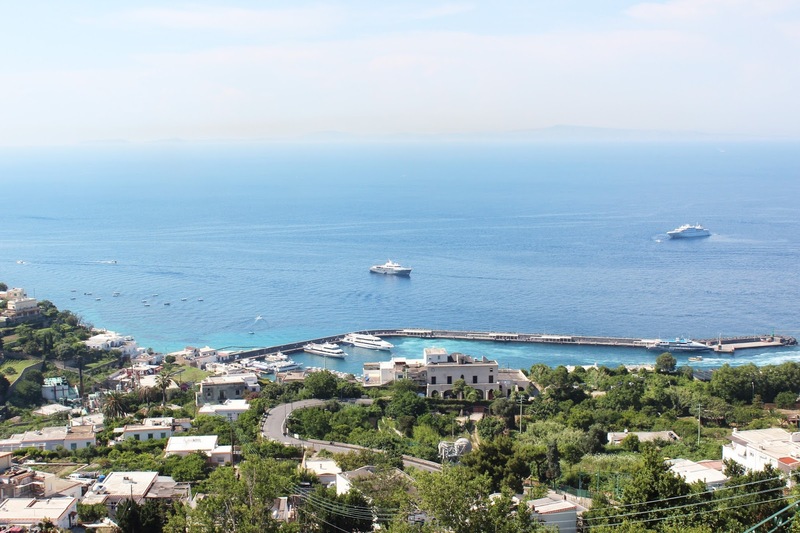 We were staying in Capri town, and the view down the hill to the harbour from the town square has to be one of the most beautiful I've ever seen. Hence the taxi! You can also get the tram up and down, and when we weren't carrying our bags, (or more correctly the boys weren't carrying our bags), we caught this. I've been to Capri once before when we did our girls Europe backpacking trip a few years ago, but we just went for the day from the Amalfi Coast. Whilst there for the day, we decided against the main tourist attraction - a boat trip to the Blue Grotto, as we thought it was too pricey. 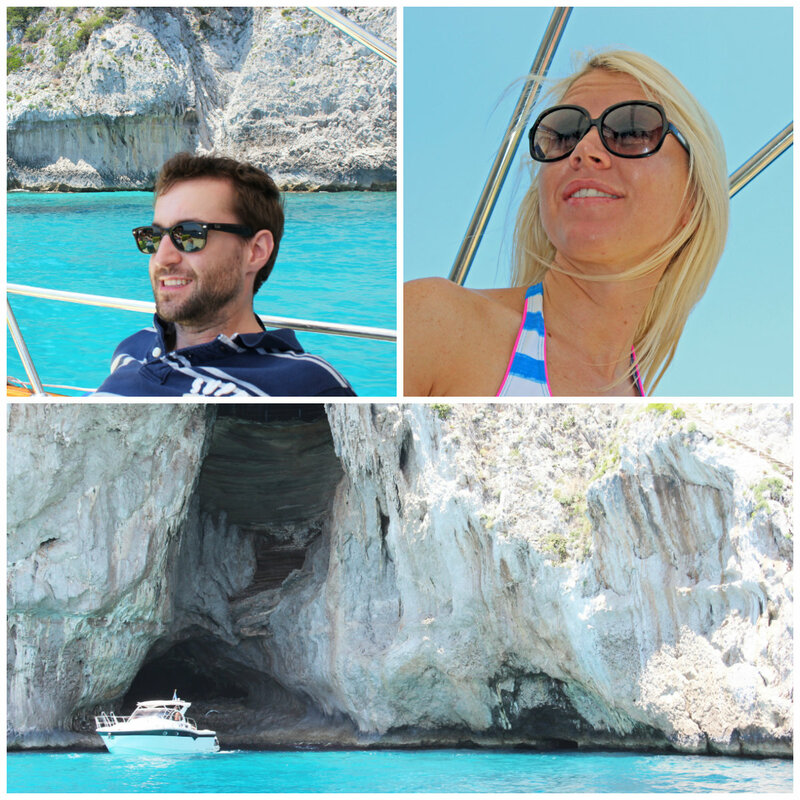 The Blue Grotto is a cave accessible only by boat. 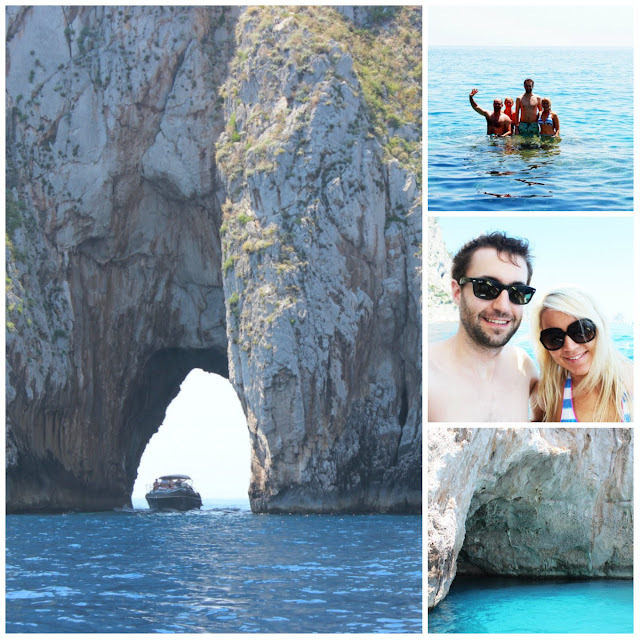 Every time sometimes talks about Capri, and I say I've been, it's the same conversation. 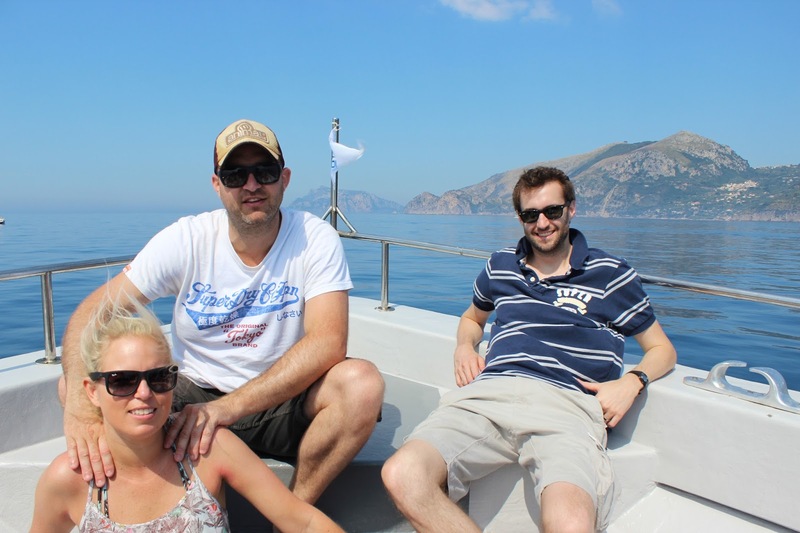 Other person who has also been to Capri: "I love Capri! How AMAZING is the Blue Grotto!" Me: "Oh, um I don't know, we didn't go there." Other person: "What, you went to Capri and you didn't go the Blue Grotto?" Me: "Well, we were backpacking for like two months, we couldn't afford it..."
At this point the person usually shakes their head and looks at me with pity, as I mumble I plan to go next time. It really is 30 euros that over the past few years, I really just wish that I had spent! And so, this time, there was absolutely NO question that I WAS going into the Blue Grotto. We hired a little boat with the most wonderful driver, Antonio. And spent the afternoon circling the island. Stopping off to swim and generally just loving life, until we arrived at the Blue Grotto. 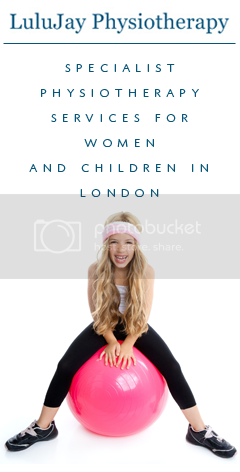 Excuse the awful picture of me below, but I need it to illustrate my point. 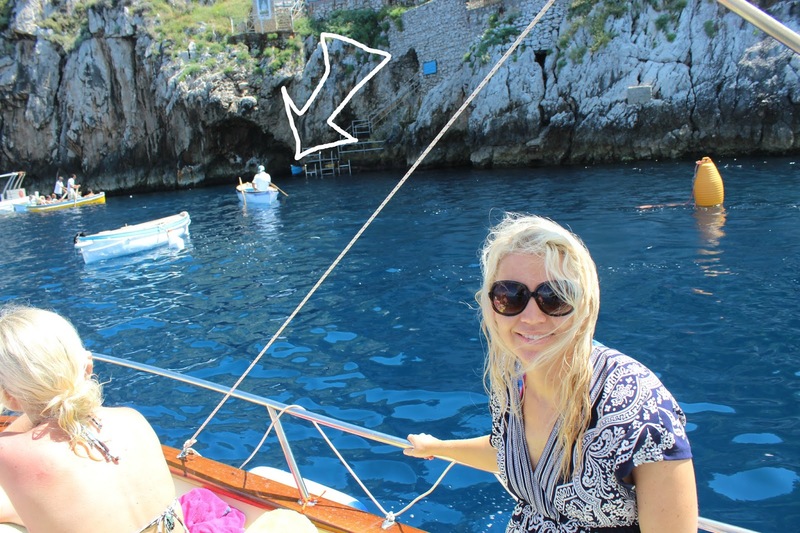 So, the Blue Grotto is only accessible by these small rowing boats. The arrow indicates the entrance, and it is so low, that everyone has to bend down, whilst the row boat driver pulls on a chain to pull the row boat through. Before briefly rowing around the cave inside. And by briefly, I don't even think that we were in there for three minutes. And at 12 Euros fifty per person, these were pretty pricey minutes. Our row boat man was awful. If he had had an eye patch, he would have been a real life Pirate. He shouted at us in the beginning to keep our hands in the boat, which was fair enough, we didn't want to lose any digits either, but we would have got the point at a normal volume too. The instructions to flatten ourselves done at the entrance were delivered so aggressively that I was pretty terrified by the time that we got in. Once inside, he whisked around in a circle, singing loudly, which added to the atmosphere, and my initial impression of him improved slightly. But whilst he was mid song, his friend in another row boat passed him a bottle of red wine and he proceeded to down about a third of the bottle of wine in a few seconds while we were in there. 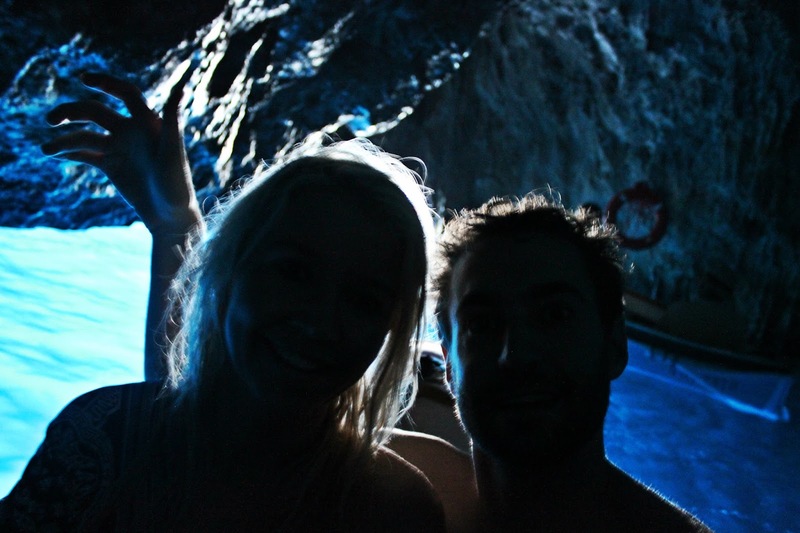 The water inside is the most incredible colour of blue and being in the cave, if I wasn't so freaking terrified of the the row boat driver, could have been a pretty surreal experience. Instead he, put the now empty wine bottle down, bellowed out a few more lines and rushed us out of the cave. There was no time for photo's, and the one above is seriously the best one we got! Upon getting outside, we worked out the reason for his rush, when he asked us for a tip. Considering we had just paid 50 Euros between the 4 of us for 5 minutes, and hadn't had the greatest experience, we gave him a few euro's more out of fear than anything else. He then started to shout at us in broken Italian/English, disgusted at the coins in his hand, saying something about how much better Japanese tourists are at tipping than we were. We got back onto our bigger boat as fast as we could, and he rowed away very abruptly still cursing us, as he went to find more people to row into the cave and get money from. Or maybe he we was hoping for another drink in there. I complained to our lovely big boat driver, Antonio, and he then spoke to the manager of row boat drivers. They offered us another trip with another driver, which was kind of them, but we declined. The Pirate was obviously then reprimanded as he started blowing kisses at us from his row boat! The Blue Grotto is truly stunning, and I am so glad that I can finally say that I've been in there, but I'm not sure the experience was quite worth it. And then on Saturday I saw Kate, and I was delighted to answer that yes, we had been to Capri, and yes we had been into the Blue Grotto, when she said. "How cool is it when they let you jump off and swim inside there?" I couldn't believe what she was saying. We didn't even have time for a proper photo and she got to swim in there! And No, I'm not going back again to see if we get to jump in. 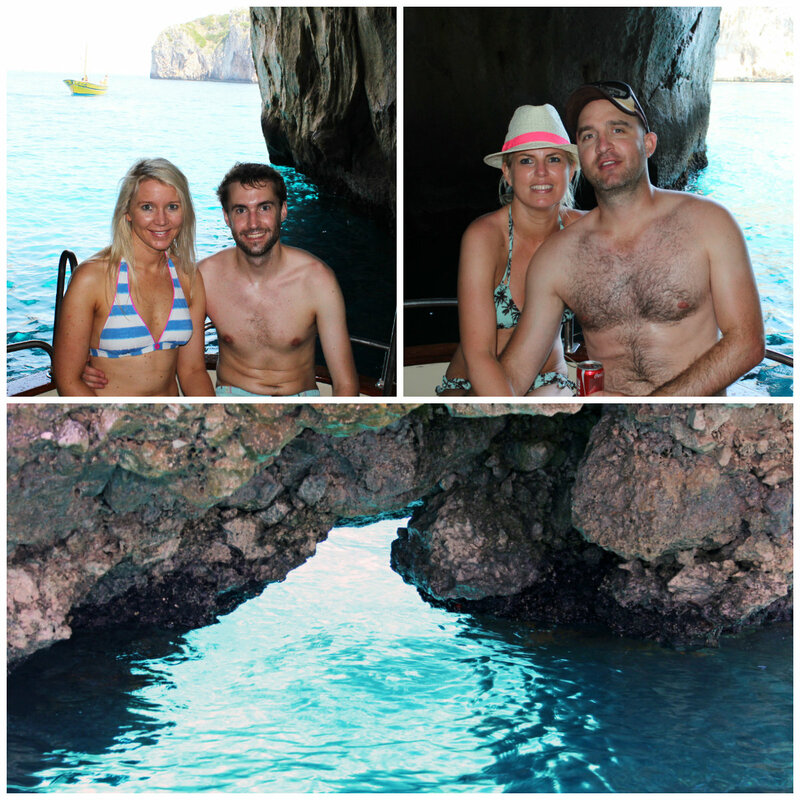 But if you are ever in Capri, do go the Blue Grotto.